Kumārajīva (Mandarin Chinese 鳩摩羅什 Jiumoluoshi; also Kiu-kiu-lo, Kiu-mo-lo-che, Kiu-mo-to-tche-po, Tang-cheu) was a Kuchean Buddhist monk and scholar whose father was originally from an Indian noble family, and whose mother was a princess. He first studied teachings of the Sarvastivada schools, later studied under Buddhasvāmin, and finally became a Mahayāna adherent, studying the Madhyamika doctrine of Nagarjuna. He is mostly remembered for the prolific translation of Buddhist texts in to Chinese he carried out during his later life. Kumārajīva’s father Kumārāyana (also Kiu-mo-yen) was an intelligent man from a noble family in India, while his grandfather Ta-to is supposed to have had a great reputation. His father became a monk, left India, crossed the Pamirs and arrived in Kucha where he became the royal priest. The sister of the king, Jīva, married him and they produced Kumārajīva. Jīva joined the Tsio-li nunnery, north of Kucha, when Kumārajīva was just seven. When his mother Jīva joined the Tsio-li nunnery, Kumārajīva was just seven but is said to have already committed many texts and sutras to memory. He proceeded to learn Abhidharma and after two years, at the age of nine, he was taken to Kashmir by his mother to be better educated under Bandhudatta. There he studied Dīrghāgama and Madhyāgama, before returning with his mother three years later. On his return via Tokharestan and Kashgar an arhat predicted that he had a bright future and would introduce many people to Buddhism. Kumārajīva stayed in Kashgar for a year, ordaining the two princely sons of Tsan-kiun (himself the son of the king of Yarkand) and studying the Abhidharmapiṭaka under the Kashmirian Buddhayaśa, as well as the four Vedas, five sciences, Bhahmanical sacred texts, astronomy, the Śataśāstra, Mādhyamakaśāstra, etc. Kumārajīva left Kashgar with Jīva at age 12, and travelled to Turfan, the north-eastern limit of the kingdom of Kucha, which was home to more than 10,000 monks. In Turfan his fame spread after besting a Taoist teacher in debate, and King Po-Shui of Kucha came to Turfan to ask Kumārajīva personally to return with him to Kucha city. Kumārajīva obliged and returned to instruct the king’s daughter A-Kie-ye-mo-ti, who had become a nun, in the Mahāsannipāta and Mahāvaipulya sūtras. At age 20, Kumārajīva was fully ordained at the king’s palace, and lived in a new monastery bult by king Po-Shun. 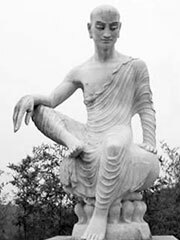 Kumārajīva proceeded to study the Pañcaviṁśati-sāhasrikā sūtra, one of the longer Perfection of Wisdom texts, relatively obscure at the time. He is known to have engaged in debates, and to have encouraged dialogue with foreign monks. Notably, he received Vimalākṣa, a Sarvāstivādan monk from Kashmir, and was instructed by him in the Sarvāstivādan Vinayapiṭaka. Jīva is thought to have moved to Kashmir. He travelled to Chang’an, the capital of China, in 401 at the request of its ruler, Yao Xing of the Later Qin. With the aid of numerous collaborators and assistants, Kumarajiva became one of the most prolific translators of Buddhist texts in history, rendering some seventy-two texts into Chinese. Among the most important texts translated by Kumārajīva are the Diamond Sutra, Amitabha Sutra, Lotus Sutra, the Vimalakirti Nirdesa Sutra, Mūlamadhyamakakārikā and the Mahaprajñāpāramitā Sastra. His translation was distinctive, possessing a flowing smoothness that reflects his prioritization on conveying the meaning as opposed to precise literal rendering. Because of this, his renderings of seminal Mahayana texts have often remained more popular than later, more exact translations. His translation of the Heart Sutra (Prajna Paramita Hrdaya Sutra), composed around AD 400, contains a line that is one of the most famous of his renderings. It is 色不異空，空不異色，色即是空，空即是色．受想行識，亦復如是 (What is seen does not differ from what is empty, what is empty does not differ from what is seen. Form is emptiness, emptiness is form. It is the same for feeling, perception, intention and consciousness).